Fresh year, old rituals. After the quiet xmas period we're back with another proper mix provided by the one and only DJ Syze, who performed a destruction ritual of mixing a bunch of thrilling dubplates, Culture Assault Records' future releases and a small doze of commercially released tracks. The end result is astonishing, and fulfills its purpose - rapes your ears (which is something we all like, don't we?). 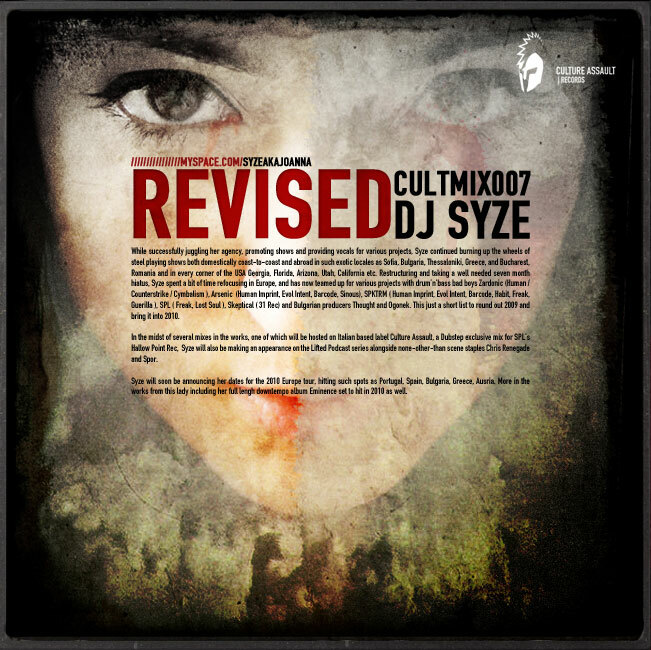 For those who don't know Syze yet there is plenty of information below and on her myspace. Cover your ears, 'cause it might make them bleed. 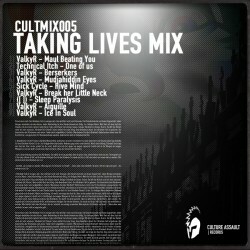 Culture Assault Records proudly presents you “CULTMIX005 – Taking Lives Mix” provided by our fresh Dubstep-Artist ValkyR. 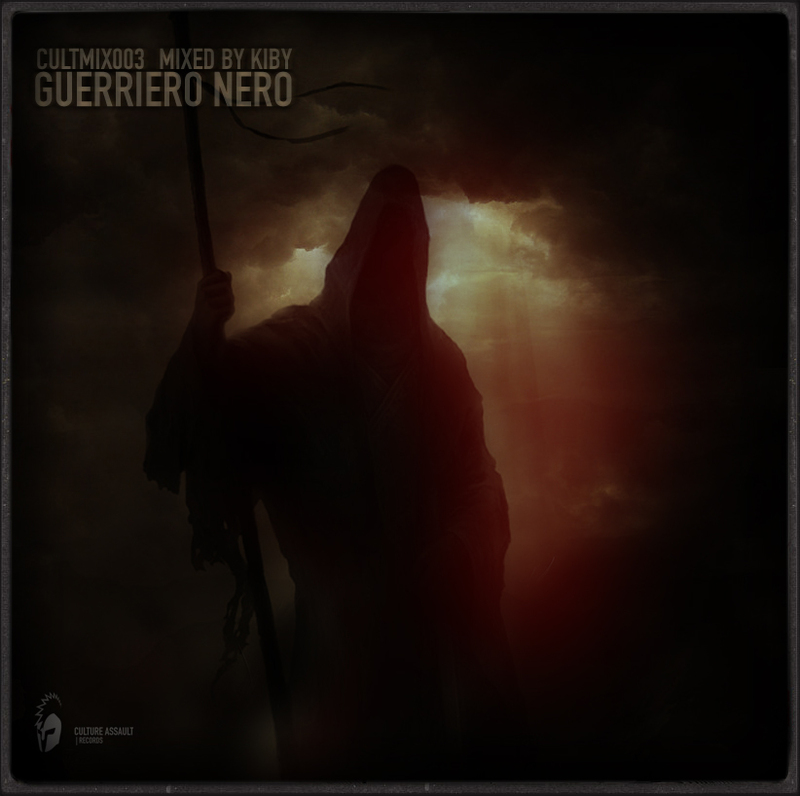 Hailing from "Champs sur Marne" near Paris and born in September 1990, he first started producing BreakBeat & DnB in late 2006 but since the Year 2008 he found his dark, disturbing icy Dubstep-Style which is now framed into this filthy Mix! 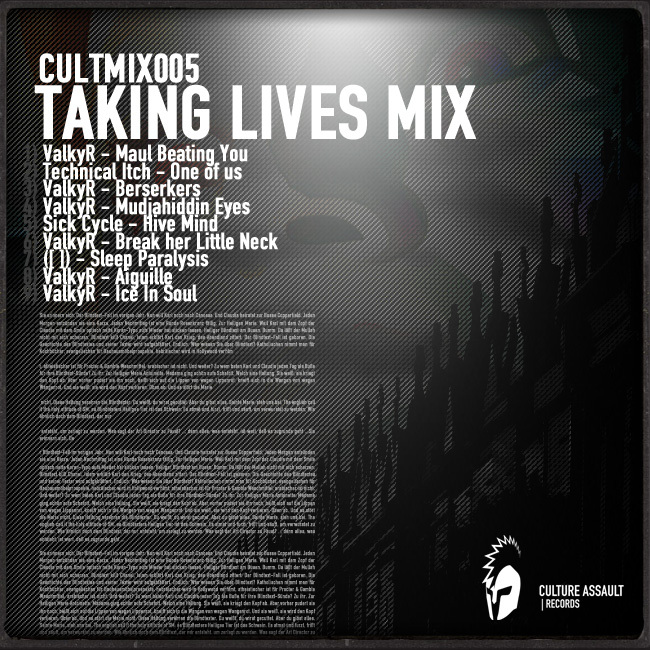 Be sure to check back for his first Release “CULTDUB002 - Taking Life”, including 6 horryfing and grim DubStep Tunes. TBR on Culture Assault Records soon!! 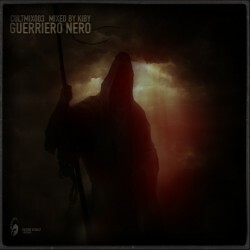 New Mixtape just flown in the Culture Assault's HQ: Guerriero Nero by the Italian dnb power lady Kiby. 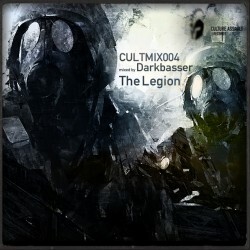 Prepare for a proper dark neurofunk experience with Tracks from The Sect, Catacomb, Future Signal and Current Value!